African Connection serves up a highly potent musical cocktail, blending soulful Afrobeat rhythms, highlife, funk, rock’n’roll, and west African traditionals. This bold new international group celebrates the spirit of music with compassion, a love of life, rhythm, and outbursts of raw emotion. Their music is storytelling from the cold north of Scandinavia and the hot streets of Ghana - uniting across borders, creeds, and prejudice. It is honesty, soul, love, and most of all it is passionate music with boundless energy. This chemistry and connection, discovered when the musicians met in Ghana in 2016, is what formed the basis for the band. With support in both Cape Coast, Ghana and Aarhus, Denmark, the band was able to play several shows and even record the debut album in both countries over the past year, highlighting the unique and growing international collaboration. To deepen the cultural diversity, the band engages with talented local musicians while traveling. This allows the musical experience to remain organic - constantly developing and transforming. 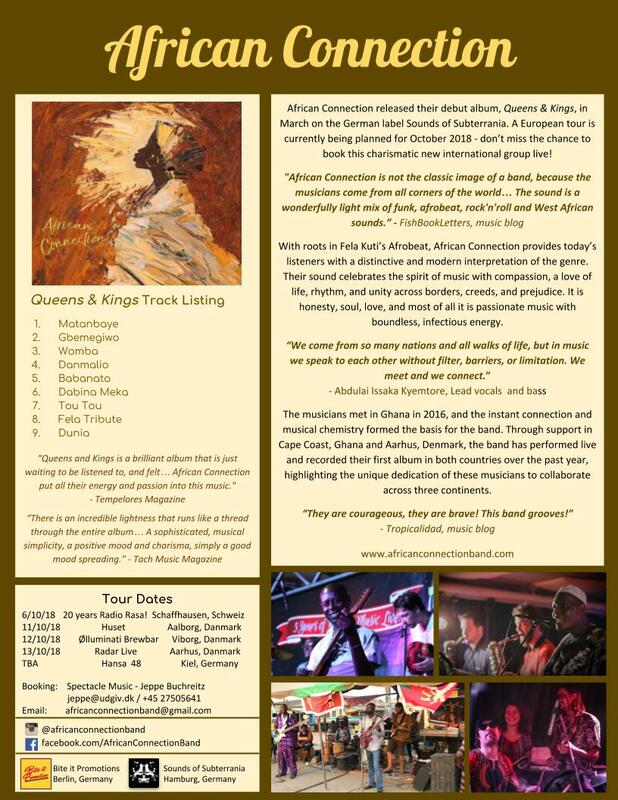 Their debut album, Queens & Kings, was released on the German label Sounds of Subterrania on March 30, 2018. A tour in Europe is being planned for October 2018.